I’ve never before felt a sense of community as I do here in our little hamlet. Our commune consists of around two hundred residents spread out from the centre of the village, le bourg in little clusters of houses. Our hamlet has about fifteen houses, including five holiday homes. Recently, two French families have moved in, both with children, which has injected a bit of life into our small community and given 6-year-old Camille, previously the single youngster on the block, some new friends to play with. Paul and Christiane, our pig-farming neighbours, are currently renovating (reconstructing might be a better description) an eighteenth century cob and stone house (ruin!) on their land. With the masons’ work nearly over, the roof on and most windows and doors installed, a task force of neighbours was invited for a week’s worth of installing floorboards and plasterboard. In addition to me, were Philippe, the previous owner of our house, Gérémie, retired jockey, Céline, Paul’s and Christiane’s daughter on a week’s “holiday” from her work in Paris; Cecile, Christiane’s sister and Henri the electrician. The mason even made a cameo appearance! It was truly an affaire du coin and a very pleasant mix of hard work, laughs and food. Culture lesson: Your typical English builder arrives on site at 8am and starts the day with a cup of tea. He may disappear around ten for a fry-up of bacon and eggs in a nearby café but will only pass an hour, if that, for lunch, eating sandwiches while sat in his van reading a newspaper. Mugs of tea are welcome anytime and by 4pm, he’ll be packing up his van to head home. Your typical French builder arrives on site at 9am and starts the day with a black coffee. He’ll work straight through to midday, perhaps even 12.30, then it’s down tools for aperitifs (an aniseed pastis with water or a glass of port, perhaps) followed by a starter (entrée) main course (plat de resistance) followed by cheese with salad and bread, with wine and cider on the table, then dessert and coffee. That’s one and a half hours minimum. They then work the afternoon through, finishing around six o’clock. I successfully introduced the concept of the English tea break to this French building site but it was Thursday before I was actually served tea, rather than coffee. The type of humour was certainly similar though. Gérémie had me howling when he was hammering away and Paul asked him if he could stop as Philippe was on the phone to the builders’ merchants and Gérémie’s instant retort was “C’est un chantier, ce n’est pas une cabine téléphonique” (“It’s a building site, not a telephone kiosk”) while carrying on hammering. Some more humour, at least to me, was to hear an outbreak of French swearing halfway up the tower where the stairs will be. Gérémie and I downed tools to investigate and found Paul holding a small window against a large hole. The error turned out to be that of the mason, hence his cameo appearance to make the hole a little smaller. I was very happy to be able to return the favour for all the things Paul’s done for me. However, tongue-in-cheek, I did question the tariff of exchange. When Paul does things for me, it often involves a huge tractor. He ploughed a bit of field intended for our vegetable plot back in March, a task taking him no longer than ten minutes. Had I double-dug it all with a spade, it would have taken me at least a month. We agreed that a fair exchange lay somewhere between ten minutes and four weeks worth of labour on site. 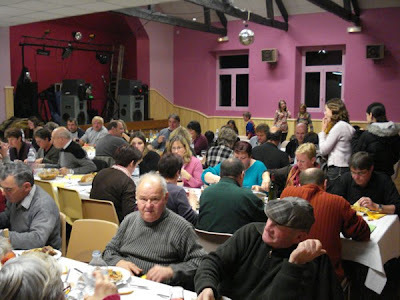 Enough work, it’s the weekend, and tonight, we’re off to a meal at the Salle de Fêtes (village hall) for a fund-raising meal for the school (see photo above). Tomorrow, all the inhabitants of our hamlet have been invited around for midday aperos by the latest arrivals, Serge, Noëlle and their daughter Morgane. I like the “idea” of cohousing and ecovillages. People live in their own house but share communal space, buildings and facilities. Gabrielle is not so sure, having spent many years in two different communal living situations and having experienced the difficulties (as well as the benefits) first hand. Luckily, we seem to have a lot of the features of those styles of living which I find so attractive, occurring naturally. We live in a small community in the Blackdown Hills on the deepest darkest bit of the Somerset/Devon border. We also have these sort of community events, and your pic is reminiscent of the quiz night we had last Saturday in the village hall complete with locally made sausages and mash served by some of the more senior village ladies!